Bheja Fry is a short, light fluff piece of a comedy - zipping by at 90 minutes and yoking more occasional chuckles than full-on belly laughs. Far from a perfect film - the pacing is often stilted, with some of the actors stepping on each other's cues and losing the comic timing - it is nonetheless enjoyable and cute. It's also refreshingly indie - something we always appreciate in Hindi filmmaking and indeed our latest flavor of the month here at the PPCC (after the wonderful Mithya and the freaky No Smoking). Rajat Kapoor and Vinay Pathak. When we were thinking of how to review this, we kept thinking: "What's the word for French humanistic comedies?" We just thought we were assigning it a French vibe because we've got Mathieu Amalric (and Giancarlo, wheeeee!) on the brain today. But then we saw that our instincts were right: Bheja Fry is a remake of the French film, Le Dîner de cons. Meet Ranjeet (Rajat Kapoor). Ranjeet is a wealthy music producer who enjoys humiliating half-baked talents at his weekly "singing competition" dinner party. Basically, he invites his friends round and hand-picks one glaring "idiot" to perform for them. Ranjeet's wife, Sheetal (Sarika), is a successful singer who disapproves of Ranjeet's cruel habits. This week, Ranjeet has found his latest "idiot": the sweet, excitable, aspiring vocalist, Bharat Bhushan (Vinay Pathak). After inviting Bharat to his home, Ranjeet meets with an accident and pulls his back. The chiropractor (surprise cameo by Tom Alter!) advises Ranjeet to call off the dinner party, but Ranjeet - after meeting the buffoonish Bharat and having Sheetal angrily walk out of the house - can't resist. He invites Bharat to stick around. Bharat, observing the marital strife, offers to help. The two are then joined by Ranjeet's friend, hipster music producer Anant (Milind Sonam), and Bharat's friend, über-nerd Asif (Ranvir Shorey, in a very hammy performance). Wacky hijinx ensue. A nice grace note: Bharat's funny and adorable work friendship with his cubicle-mate. Whoa! Tom Alter showed up! And, for once, we hear him speaking English (with an American accent - interesting! We thought he'd have an Indian one)! Most of the gags are low-key and filled with a sort of childlike glee. Bharat keeps convincing Ranjeet of a number of silly plans to prank call all the possible men Sheetal could have potentially fled to. There's also an underlying current of humanistic heart-squish, as the audience clearly sides with the unknowingly-victimized Bharat, who is so open-hearted and adorable. Poor Bharat! Don't hurt him, evil Ranjeet! All he wants to do is sing for you! In fact, amidst all the yelling, there are even unexpected flickers of warmth between the bastardly Ranjeet and Bharat. Memsaab mentions her favorite scene as being Bharat's impromptu lullaby to Ranjeet - and it's ours too! Very funny. For a film about mean-spirited mockery, this film's style is instead quite forgiving and gentle. Ranvir Shorey just sails in on the good ship crazy in this one. The script - which is very strong, considering all the relationships - was written in Hinglish, heavy on the English. This made some of the dialogues feel stilted to us - particularly Rajat Kapoor and Sarika's. The strongest performance was definitely Vinay Pathak's: this was really his show, and he was delightful. The rest of Team Parallel - Rajat Kapoor, Ranvir Shorey, Sarika - were okay, though there seemed to be some mismatch in tone (at least, where did Ranvir's performance come from?). Fun, undemanding, easy. Not a film you'd name your first-born after (ahem, that would be Tezaab) but not a bad way to spend 90 minutes either. I didn't know this was based on that French movie! I saw that a few years ago - it's very funny. I might skip this one if it's not as good AND if Ranvir is off his game. Vinay Pathak was good in Manorama Six Feet Under, as well. Indie Stand-by Sarkia was in that one, too. The downside of the Ranvir Vinay pairing is that when they get together they immediately slip into this chemistry that sometimes makes you think these two are in a different movie than the rest of the cast. or maybe I'm projecting because I remember them from their VJ days. Bheja Fry 2 is apparently in the works right now. Memsaab - I actually did laugh quite a bit at Ranvir's performance, but it was from waaay out of left field. Vinaaaaay: so freaking ADORABLE. Filmi Girl - Meh, I would say it's quite good, at least worth one viewing. Thanks for the recs! I've asked DVDwallah to scrounge out Waisa Bhi... I like Arshad a lot, but he's never taken over the PPCC (as you may have noticed). Maybe he'll be next! Amrita - I can't believe they were VJs! Actually, no, I can believe Ranvir was, but Vinay?! Yup, that's where they met I think - they had a show for (the Rupert Mudoch owned!) 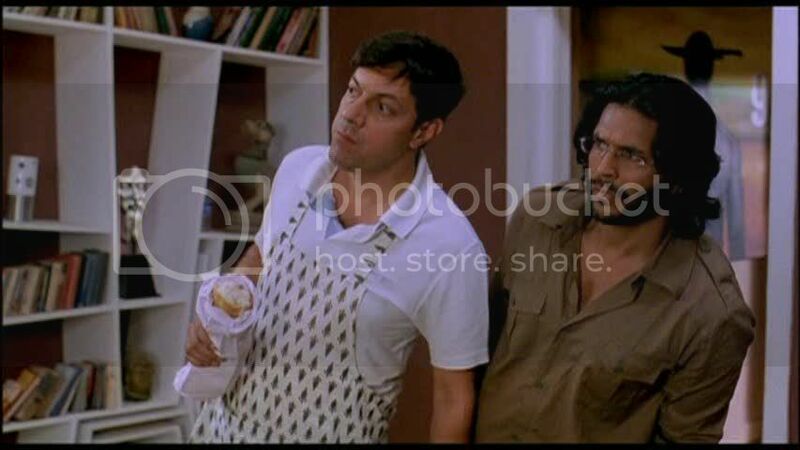 Channel V called House Arrest and along with Jaaved Jaffrey's Flashback (a truly funny, engaging show about songs from old movies), it was the show I watched all the time. They weren't very VJ-y either which is why I liked them. They have (had?) another show a couple of years back too which I didnt know about until recently. Sarai - Awww, Sarai. You win for best comment. PRAAAAN!!!! Amrita - Eee, a link, danke! Vinay seems so hip and trendy in that link.